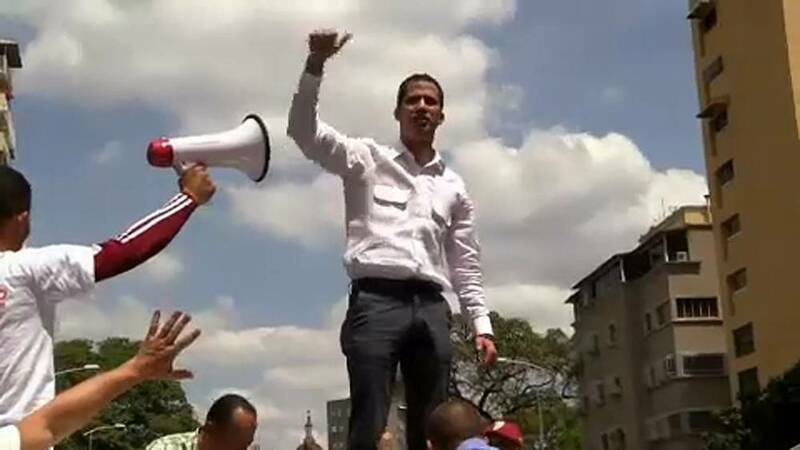 Des agents du renseignement ont arrêté jeudi à l'aube Roberto Marrero le chef de cabinet de l'opposant vénézuélien Juan Guaido, président par intérim autoproclamé. 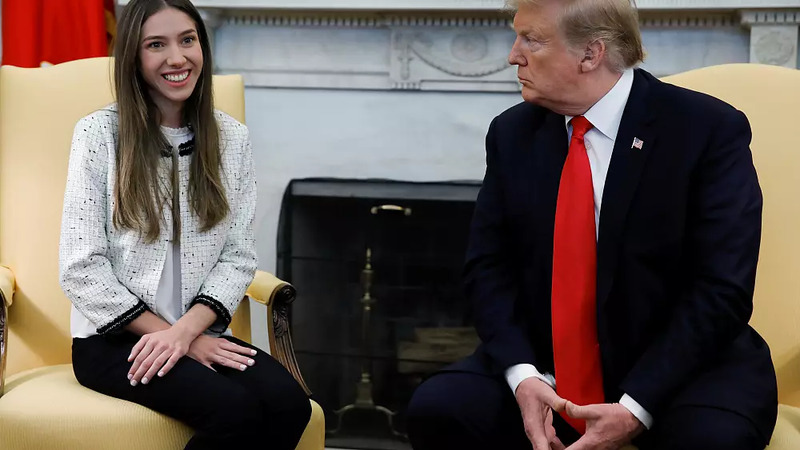 "I am a journalist, I have family in Venezuela, and I knew the reality was very different from what the media is portraying, but still I was surprised. 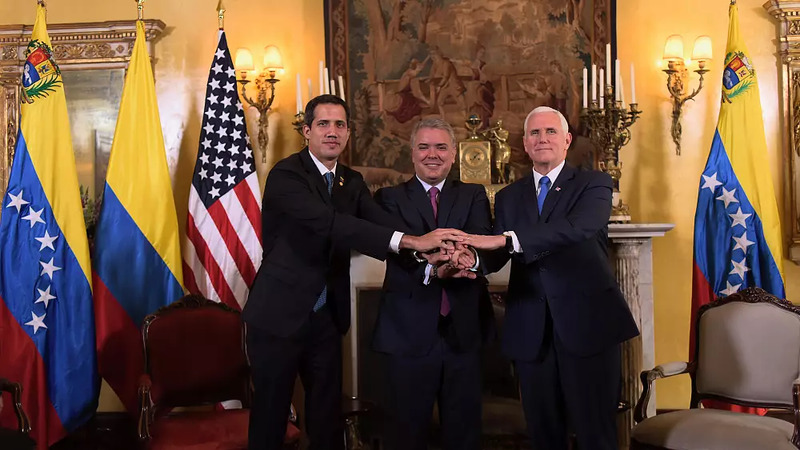 The first thing we noticed was the lack of poverty..."
#soldados #militares #venezolanos #venezuela traicionaron a su pais por 20 mil USD los cuales #gaydo #guaido no les pagó y ahora exigen que Gaydo se haga presente para ayudarlos, dicen que eran aproximadamente 300 y que ahora son 200. 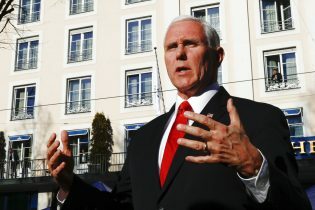 The decision to extract all US diplomats "reflects the deteriorating situation in Venezuela as well as the conclusion that the presence of US diplomatic staff at the embassy has become a constraint on US policy," Pompeo said in a statement early Tuesday, without elaborating on either the constraints or the policy options their removal allows for. 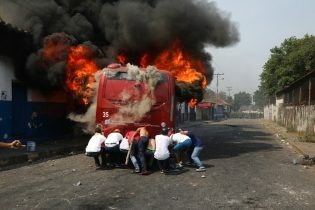 At the same time, the sheer level of dysfunction in Venezuela is likely to restrain Washington to some degree. 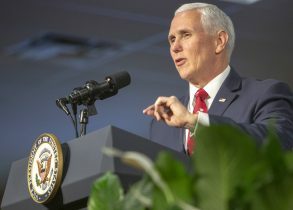 "There are a number of diplomatic and financial and economic steps that governments can take," Abrams said. 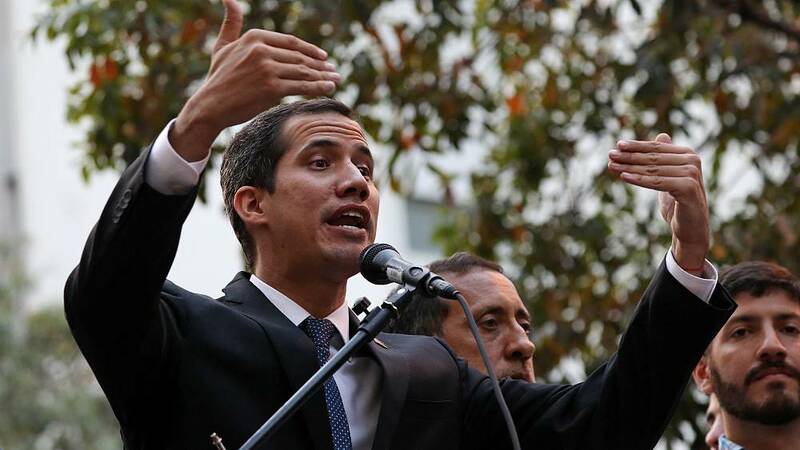 "The arrest of Juan Guaido would lead a lot of countries to react very quickly." Reading this I wondered about something: Who started this vicious cycle? 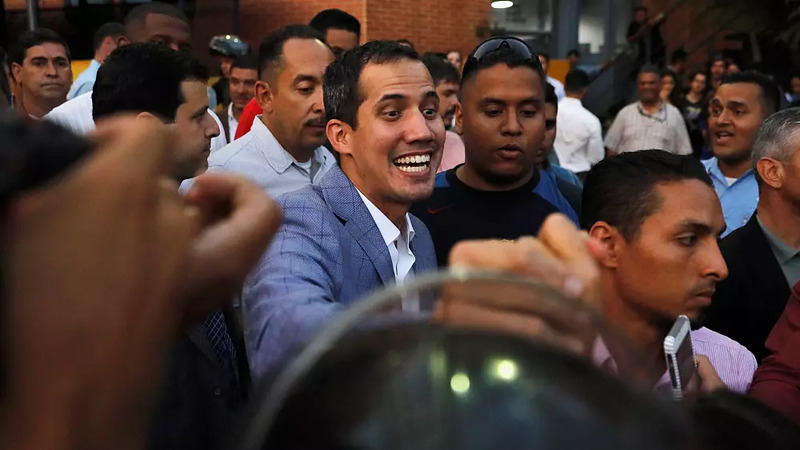 If it was Maduro, who behaved like an autocrat, thus needed to be removed from the Venezuelan government, embargos and sanctions were clearly the wrong way to go. You cannot remove an autocrat by starving and impovering his or her people. This is not going to end up well for the one who is located on the moral high ground. 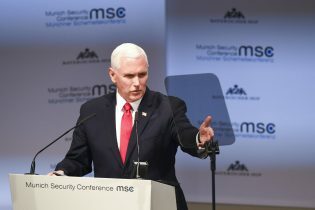 The autocrat is going to create the concept of the enemy, which in this case are the US. The people may starve, and the opposition might proliferate and become stronger, but in the end, the autocrat will stil be there. Nothing has been won, but an entire people has been hurt by the high-grounder. Well done, then. If it was the US who started the cycle, everything should be clear. 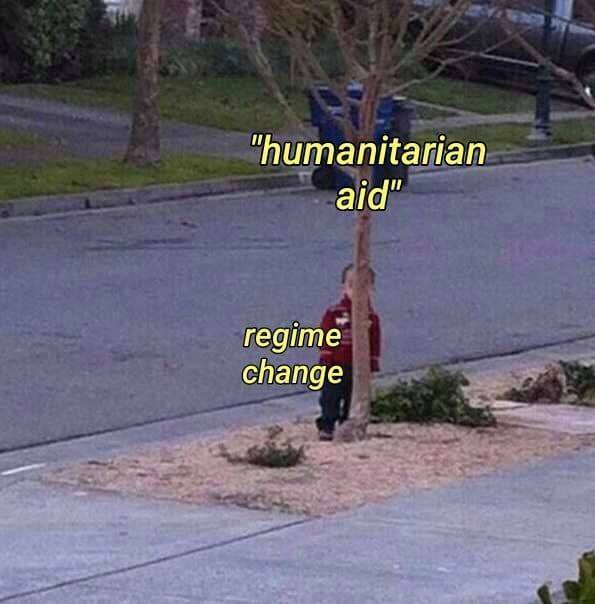 They tried one of their infamous military interventions, therefore created an evil enemy, as they did in the Middle East, the Kosovo, and so on. Well done, then. Venezuela hat den deutschen Botschafter ausgewiesen. 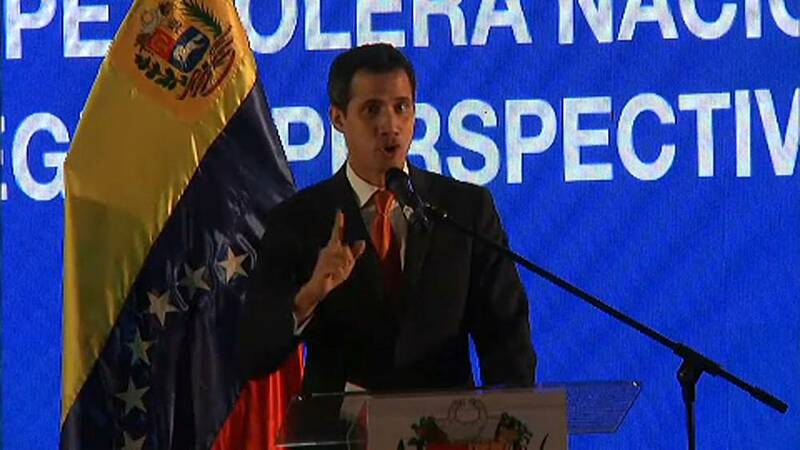 Gemeinsam mit Amtskollegen hatte er den selbsternannten Übergangspräsidenten Juan Guaidó empfangen. Eine unzulässige Grenzüberschreitung? 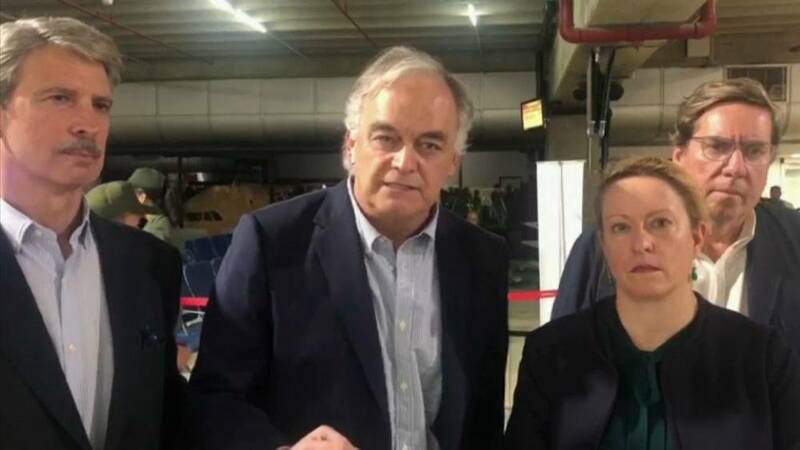 Ein Gespräch mit Ex-Diplomat Hanns Heinrich Schumacher. Venezuela: Was darf ein Diplomat? 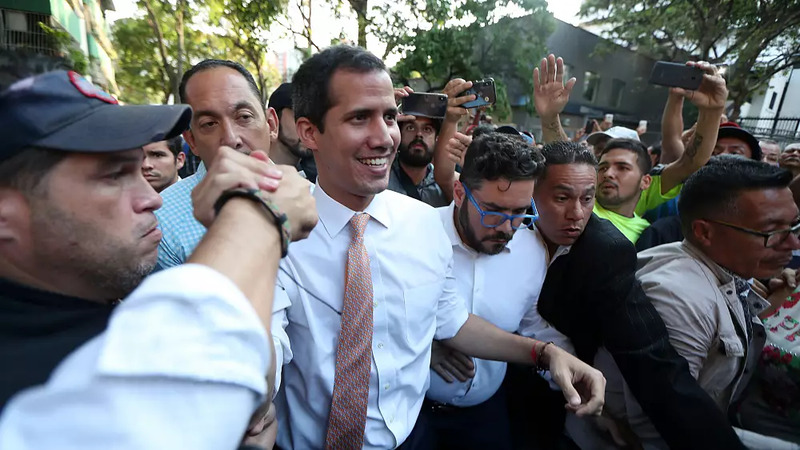 "Esto no es un presidente"
"If he wanted to build a democratic Venezuela, he had the opportunity to do so, but he did not," Mr Abrams said. 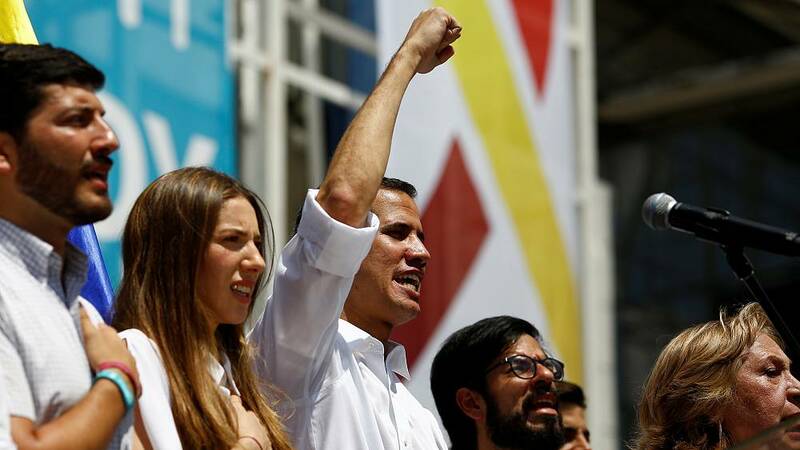 Venezuela's president calls for "anti-imperialist marches" to coincide with opposition protests. 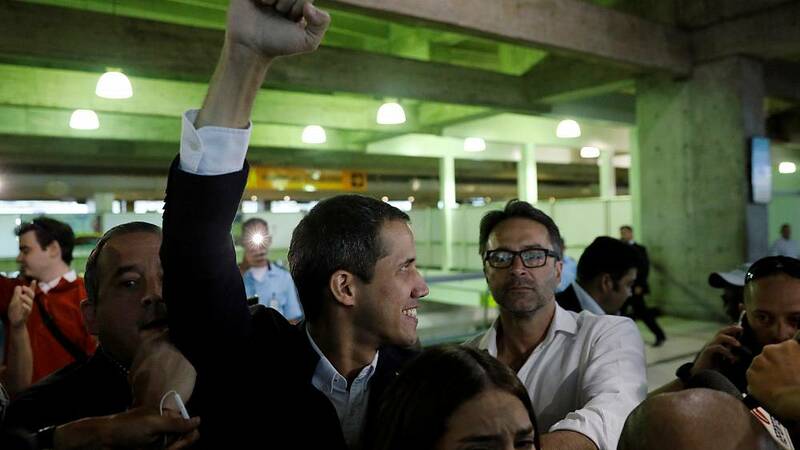 L'opposant Juan Guaido a été acclamé lundi en rejoignant le lieu du rassemblement de milliers de ses partisans dans le centre de Caracas, moins d'une heure après son arrivée à l'aéroport international de la ville. 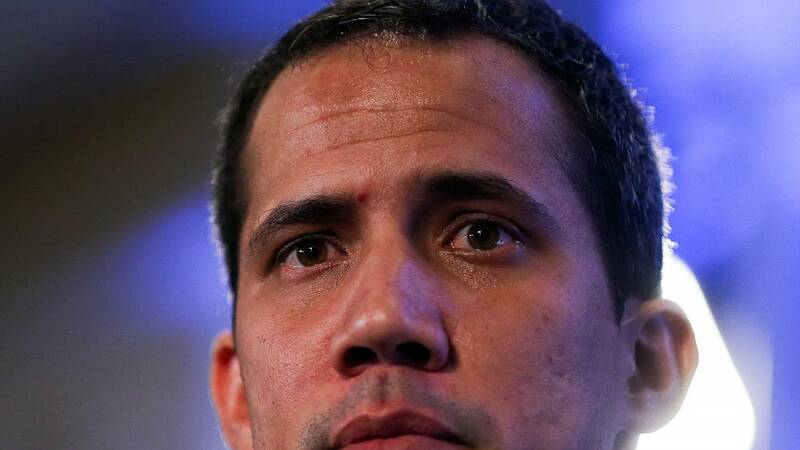 A Buenos Aires, Juan Guaido a de nouveau réclamé le départ du président vénézuélien Nicolas Maduro et a pointé du doigt l'action de Cuba, qui soutient le chef d'état au pouvoir. We should understand that the traditions of “going into the mountains” hold a fascination and moral example in Latin America. 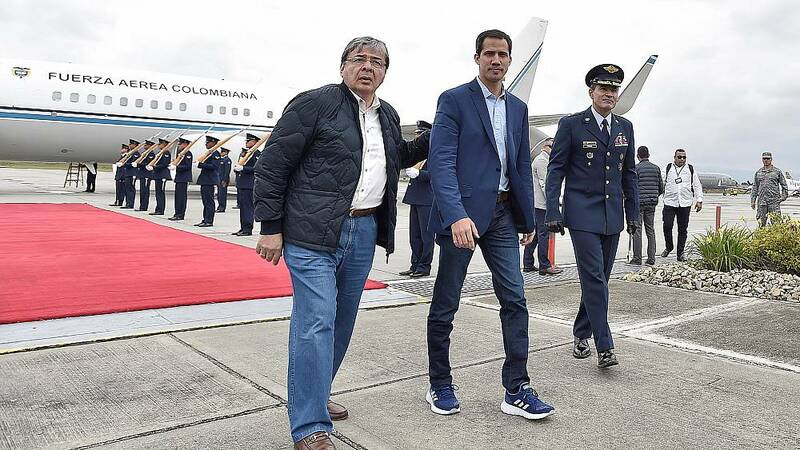 Better armed and trained than ever the FARC was in Colombia, would we wish a 50-year civil war on our southern neighbor? 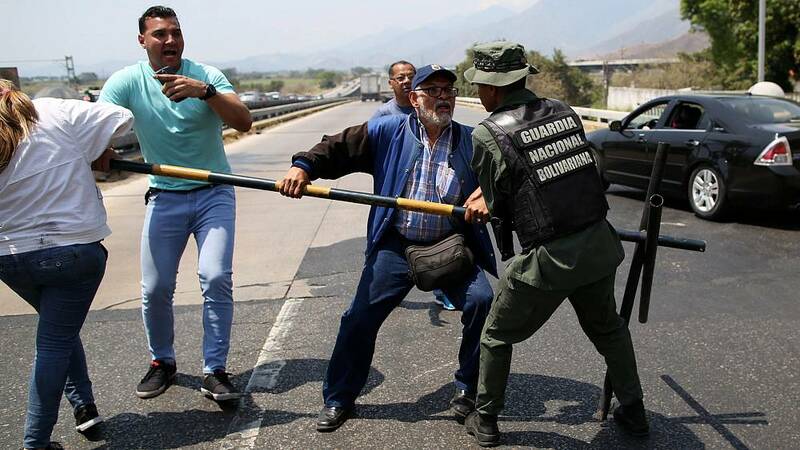 The Venezuelan military must render itself to its own people, not to a foreign power. 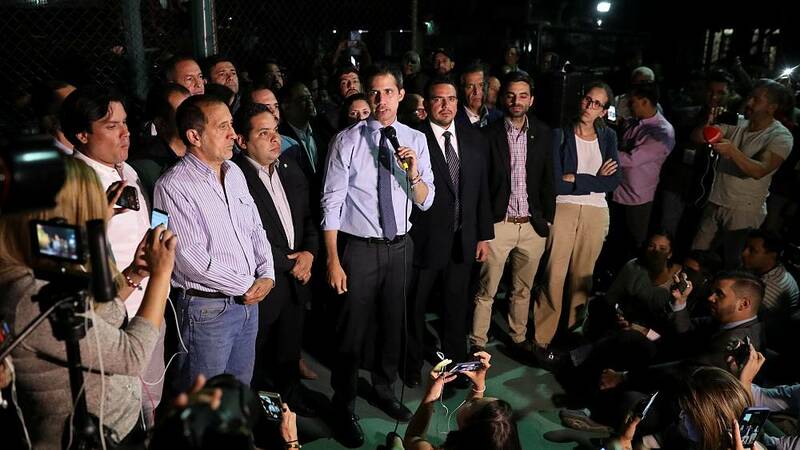 Der gestrige Tag war als Showdown proklamiert worden zwischen dem amtlich inaugurierten Präsidenten Venezuelas und dem selbsterklärten Interimspräsidenten. 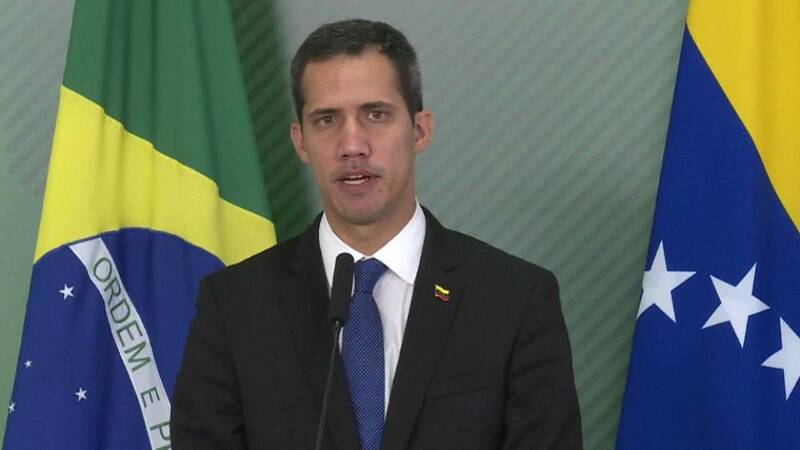 Mit Hilfslieferungen, die via Lastwagen oder Schiff von außen nach Venezuela transportiert werden sollten, um Versorgungsengpässe zu kompensieren, wollte sich Oppositionsführer Juan Guaidó als Staatsführer zeigen, der das Gute für das Land im Sinn hat und - vor allem - die größere Unterstützung hinter sich. Dies zu zeigen, ist ihm nicht gelungen. Das kann man als Zwischenfazit nach einem Tag der Auseinandersetzungen, die angeblich mehrere Tote und angeblich 285 Verletzte forderte, festhalten. 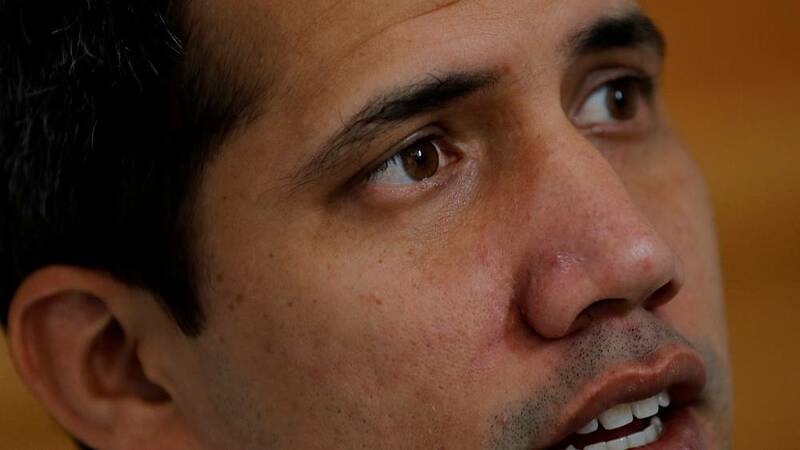 Zentral für den Machtwechsel, den Juan Guaidó verfolgt, ist, ob er das Militär in Venezuela hinter sich bringen kann. 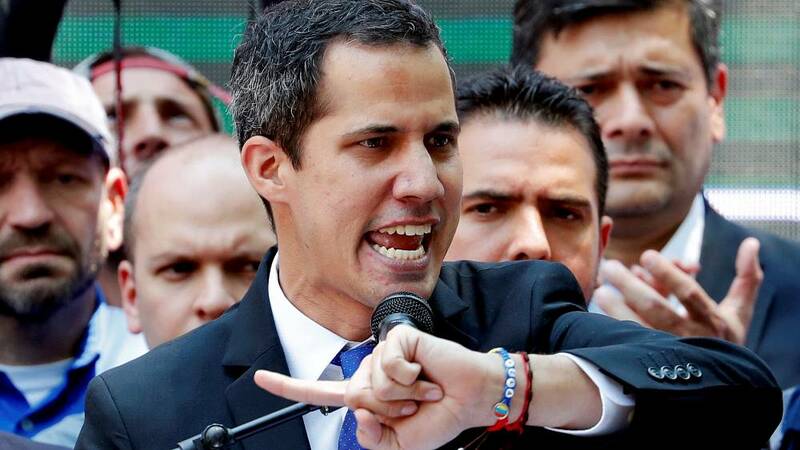 Der Verweis auf die Unterstützung der Armee stand dann auch hinter seinem Auftritt im Nachbarland Kolumbien, wo Guaidó signalisierte, dass er nur mithilfe von Armeemitgliedern auf die andere Seite, ins Nachbarland, gelangen konnte. Dem folgte aber am gestrigen Samstag kein Signal, wonach ihm aus Militärkreisen eine entscheidende Unterstützung zukommt. Laut Angaben der Zeitung El Universal wurden von der kolumbianischen Regierung lediglich 60 Überläufer gezählt. 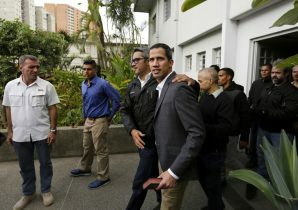 Ansonsten hielten sich die Grenzwächter an die Anweisungen des Präsidenten Venezuelas, Nicolás Maduro, der hinter den Hilfslieferungen einen "politischen Plot" sieht, dessen Absicht es ist, in Venezuela einen Machtwechsel zu erzwingen. 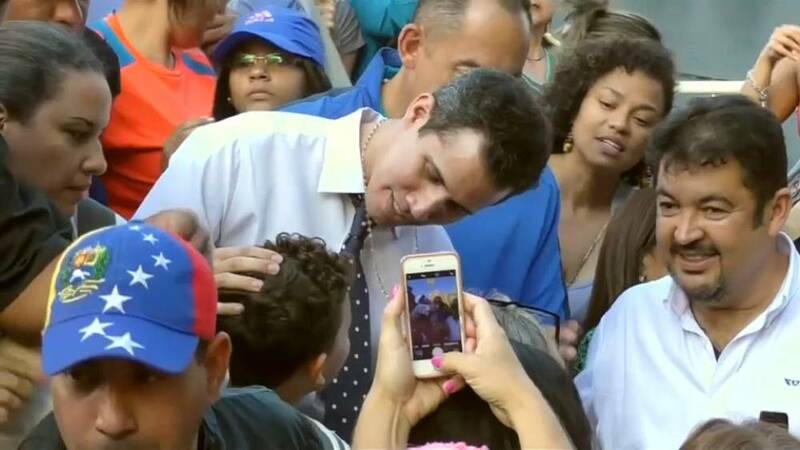 Die Grenzen waren dicht, ein paar Lastwagen gelangten dennoch auf venezolanisches Gebiet, zwei wurden angezündet. 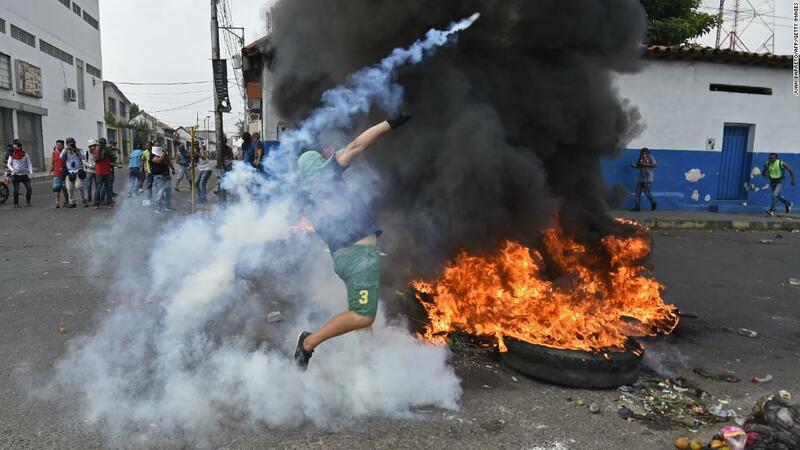 "Wir prangern die Verweigerung Maduros an, dass Hilfsgüter nach Venezuela kommen. Welche Art von krankem Tyrann hält Nahrungsmittel von seiner hungrigen Bevölkerung fern? Die Bilder brennender Lastwagen mit Hilfsgütern sind widerwärtig." Zugleich kündigte Pompeo "Maßnahmen" an. 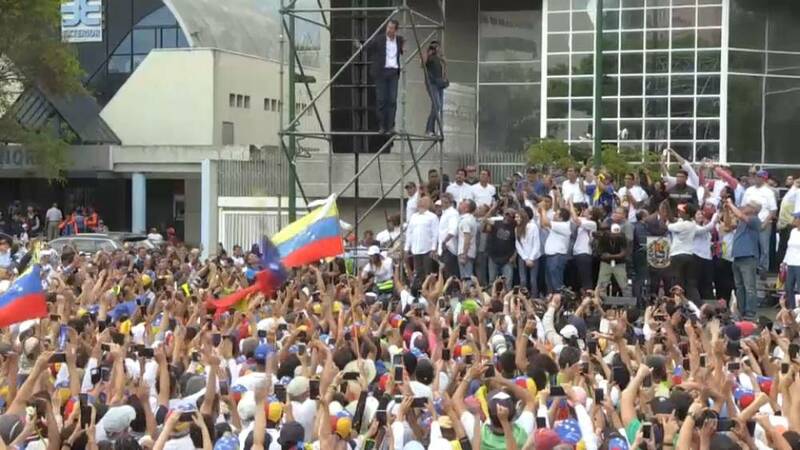 "Die Vereinigten Staaten werden Maßnahmen gegen solche Aktionen unternehmen, die sich der friedlichen Wiederherstellung der Demokratie in Venezuela verweigern." Was mit der Drohung genau gemeint ist, lässt Pompeo offen. Im Gespräch sind neue Sanktionen. Wer für das Anzünden der Lastwagen genau verantwortlich ist, kann, wie aus dergleichen Konfliktsituationen etwa aus Syrien bekannt, nicht zweifelsfrei festgestellt werden. Es gibt unterschiedliche Darstellungen. 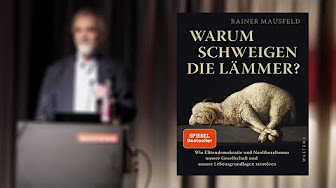 Es bleibt angesichts der Vorgeschichte des Bühnenstücks zu den Hilfslieferungen der Eindruck, dass genau solche Bilder Ergebnis einer beabsichtigten Provokation waren. Die konkrete Hilfe durch Lieferungen von Lebensmitteln und Medikamenten war nebensächlich; leere Lebensmittelregale und Versorgungsnöte der Bevölkerung im ölreichen Venezuela sind seit vielen Jahren Kulissen für eine politische Auseinandersetzung, die mit allen Tricks und Waffen arbeitet - auf beiden Seiten der Fronten. 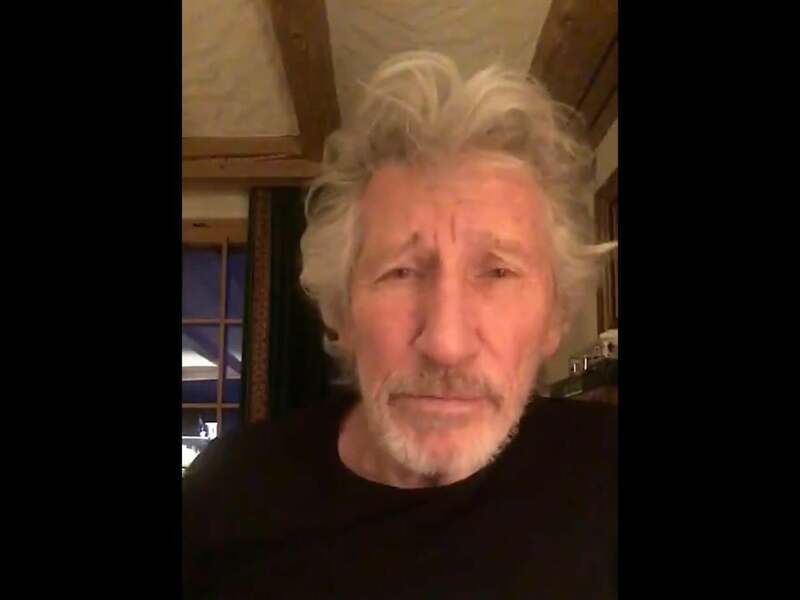 «Live Aid» comes to Venezuela! 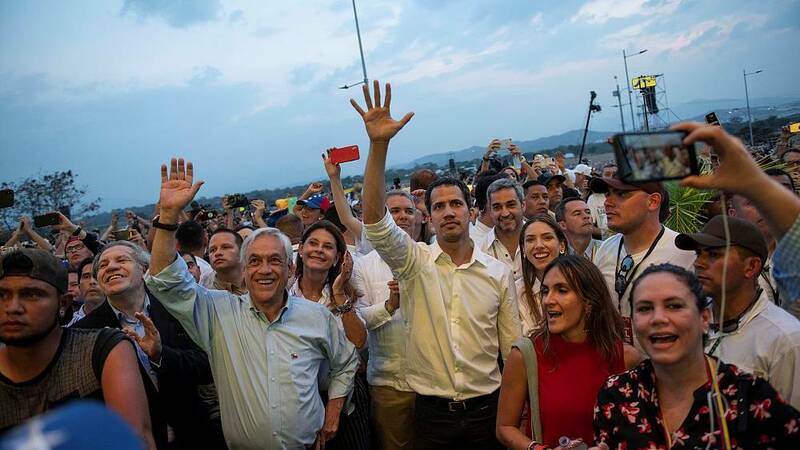 On Monday, the government of President Nicolas Maduro stated that it would hold its own concert this weekend on Venezuela's side of the border, according to the Associated Press (AP), opposite the Branson-led concert which will take place on the Colombian side of the border. 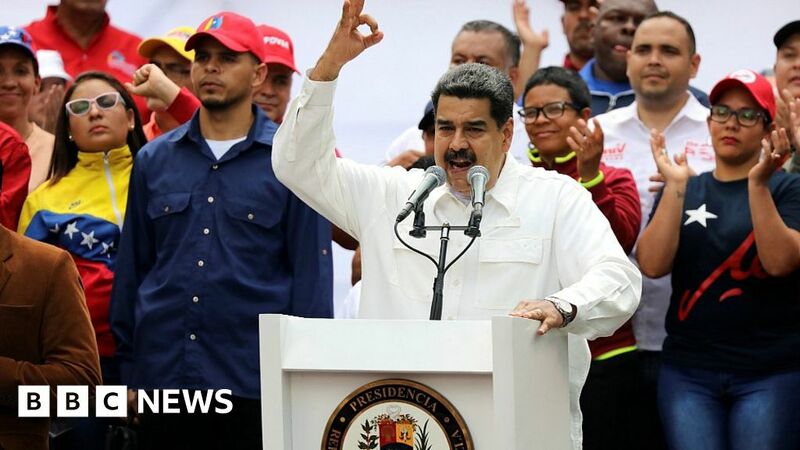 "Venezuela Aid Live" hopes to raise $100 million within the next two months, so that humanitarian aid can be delivered to those in need. What will the line-up look like? 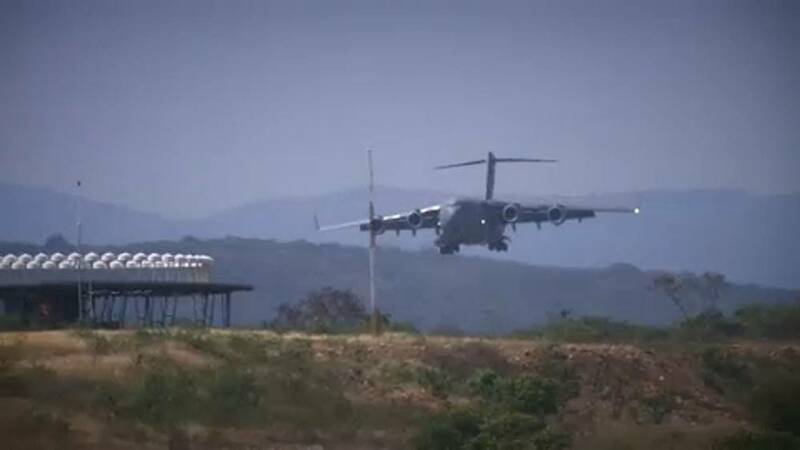 Speaking to AP, Branson said that the organizers of Friday's event want to make it "a joyous occasion", adding that they hope that "sense prevails and that the military allows the bridge to be open so that much-needed supplies can be sent across." Both musical events are slated to take place over this coming weekend. 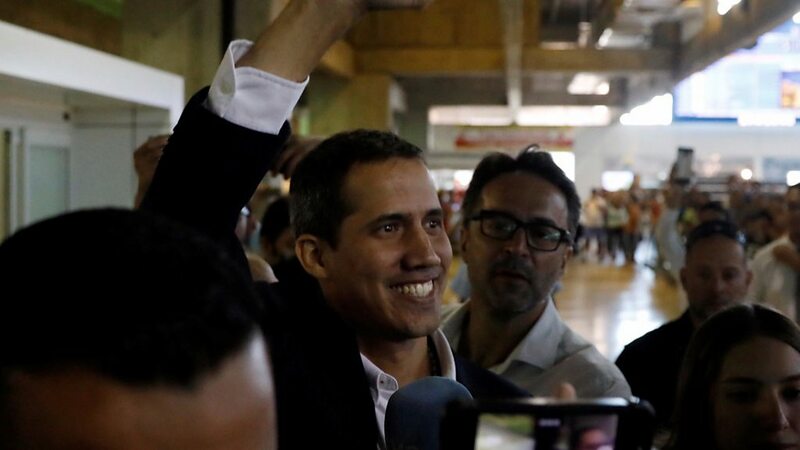 Le président par intérim autoproclamé du Venezuela a appelé ses supporteurs à s'engager pour acheminer l'aide d'urgence qui arrives aux frontières. 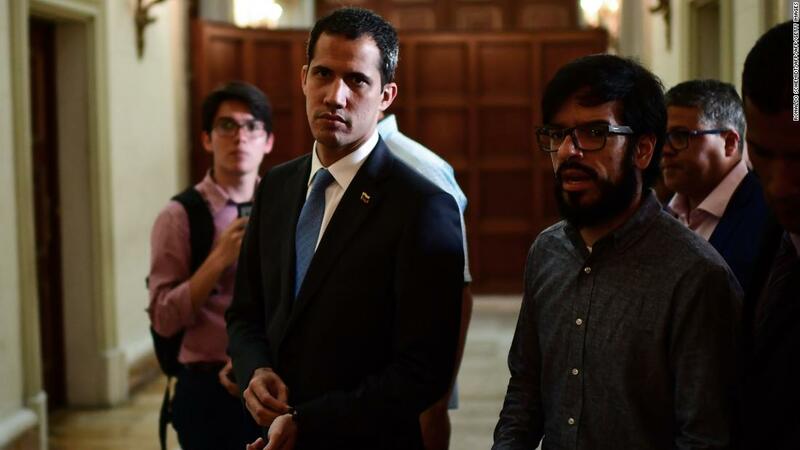 Le président par intérim autoproclamé du Venezuela a appelé ses supporteurs à s'engager pour acheminer l'aide d'urgence qui arrives aux frontières.